My Favorite Lasagna is really a family favorite. 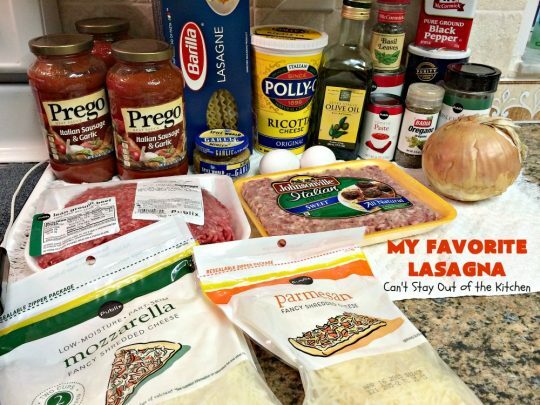 I’ve tried a lot of different lasagna recipes, especially earlier in our marriage, in order to find just the right one. Some were too saucy and fell apart easily. Others were just too expensive. Sometimes the combination of flavors didn’t cut it. 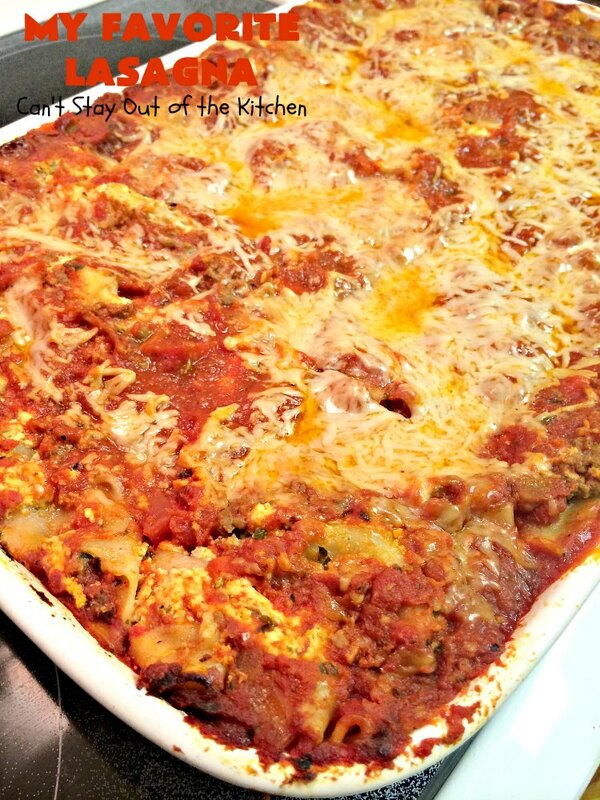 But from the moment I put a forkful of this lasagna in my mouth, I knew it would become My Favorite Lasagna recipe. About 15 years ago I found a lasagna recipe that had a nice kick to it. 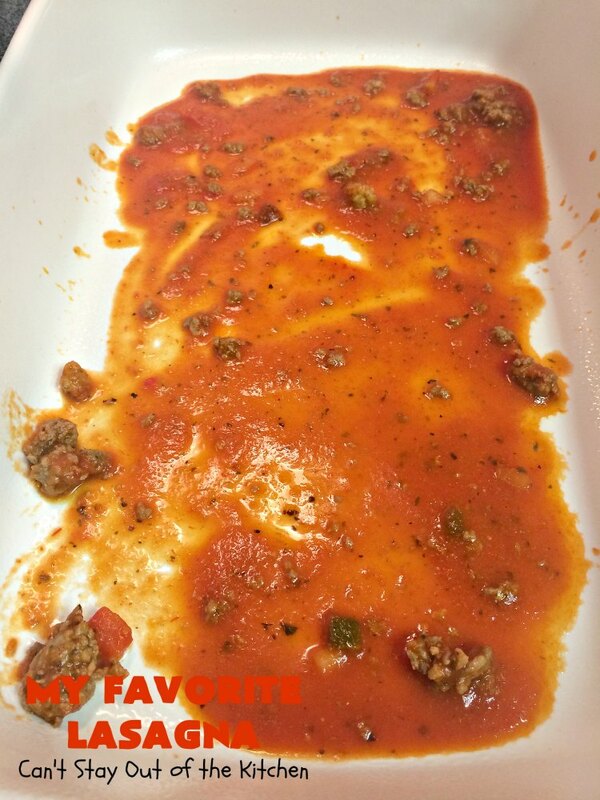 It used Italian sausage and Italian Ro-Tel diced tomatoes with diced chilies in the sauce. As the recipe is written it’s probably perfect for most. But I like a few more layers of noodles. 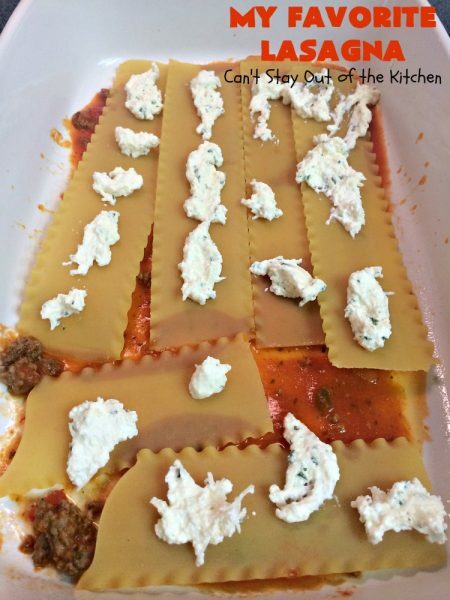 I usually end up using an extra bottle of prepared spaghetti sauce and just put dabs of sauce and the ricotta cheese mixture in between each layer. My husband and I were hosting a Christmas progressive dinner with our Sunday school class and this was brought by Darci Herr as part of the main course meals. It was FABULOUS! I loved the subtle, spicy taste. 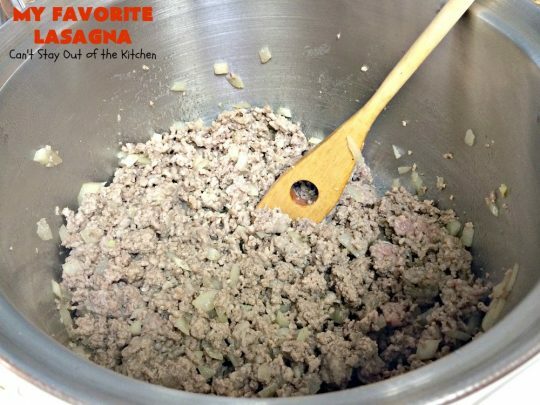 Darci made her lasagna with ground turkey, and I have tried mine that way a few times but I really prefer it with ground beef. Last night I made this again for company and I used a ground sirloin. The wonderful thing about this recipe is you use REGULAR lasagna noodles, but you DON’T pre-cook them! That’s right. They cook while in the oven. And you don’t have to pay extra for the special kind of noodles you can do that with. 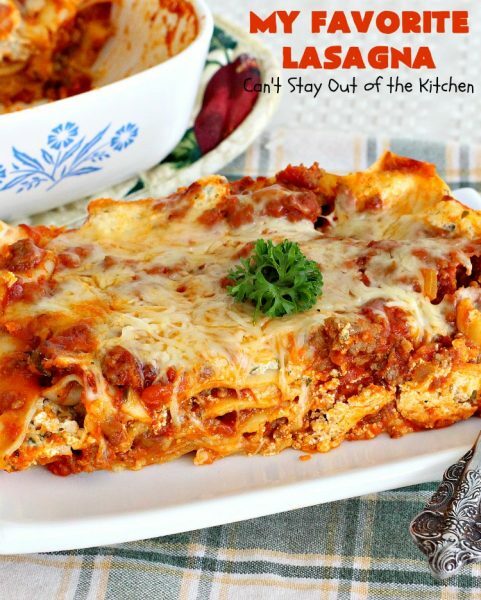 If you’re looking for a sensational lasagna recipe this one sure fits the bill. Give it a try and you’ll see why it’s our favorite. When I initially posted this recipe in July 2012, I took very few pictures and those that I did take were blurry, grainy and not very appealing. I recently remade this recipe for my husband’s birthday when we visited his family during the holidays (December 2014), and I took new pictures and updated what I did in the recipe. This is not a recipe that you have to slavishly follow. I stretch it out to feed however many I need to feed! 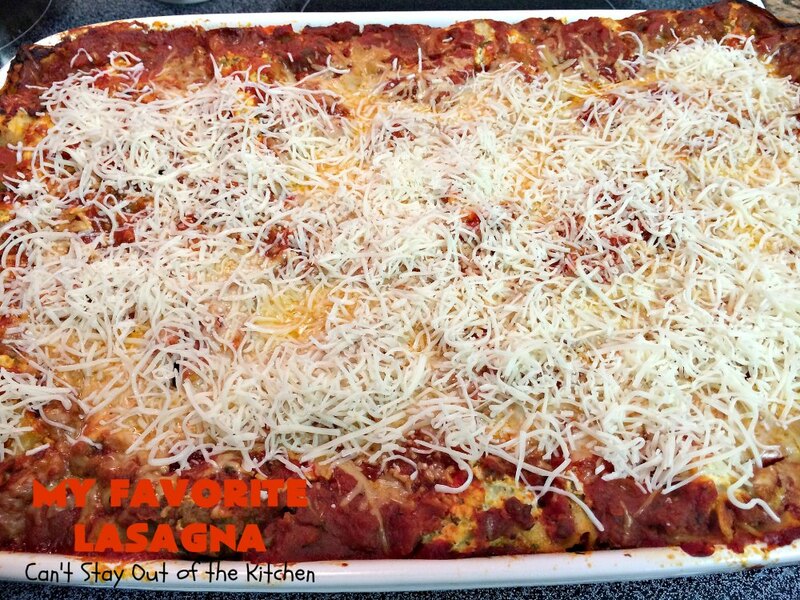 My Favorite Lasagna makes enough to serve a crowd. So, if you’re not interested in leftovers for the office after you make it, then I recommend cutting it in half and bake in an 8×12″ or 9×13″ baking dish. Make as many layers as you have ingredients for. 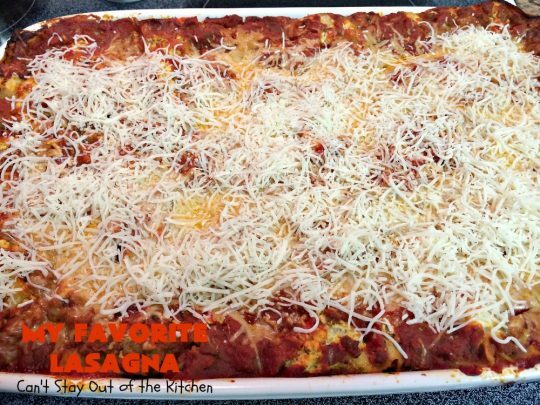 I prefer more layers because it helps the lasagna set up better. Instead of putting half the cheese and half the filling on three layers of noodles, I usually just dab the cheese and sauce on about 5-7 layers of noodles. Do what works for you. My Favorite Lasagna is something special. Darci’s recipe has only 3 layers, but I use a 16-oz. or 24-oz. box of lasagna which will make 6 layers with 4-6 noodles on each layer. 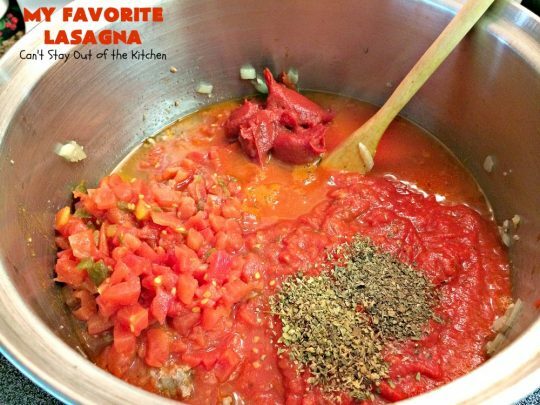 This lasagna recipe has a little zip from the Italian sausage and diced tomatoes with green chilies included. 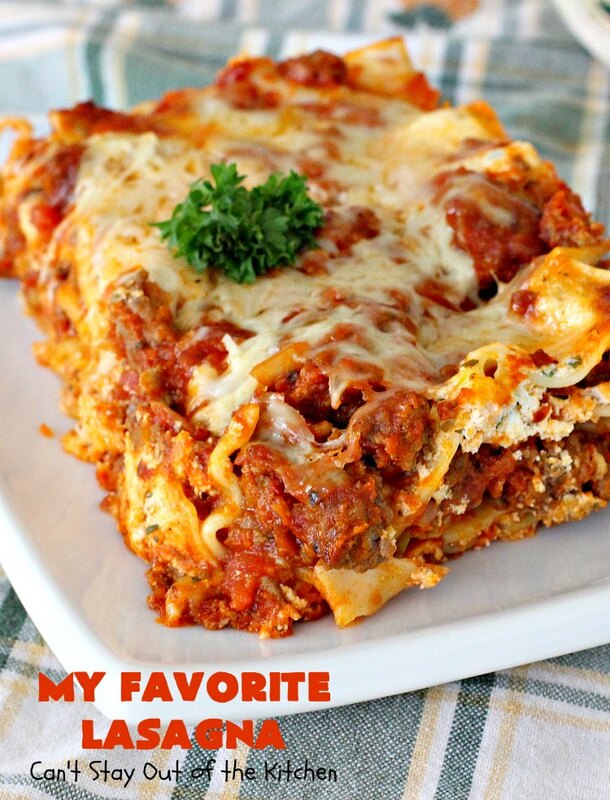 Every bite of My Favorite Lasagna is mouthwatering. For the ricotta cheese mixture: Place eggs, ricotta cheese, mozzarella cheese, parmesan cheese, parsley, salt and pepper in a mixing bowl. Stir ricotta mixture until well mixed. Set aside. Sauté onion and garlic in a tablespoon of olive oil, then add ground beef (sirloin) and Italian sausage. Cook until no longer pink, then drain. I have a friend who uses a potato masher to chop ground beef into smaller, more uniform pieces when she cooks it. I usually just break the larger pieces up with my wooden spoon or a spatula. Add the rest of the sauce ingredients: spaghetti sauce, tomato paste, and Italian Ro-Tel tomatoes with diced chilies. We couldn’t find the Italian Ro-Tel yesterday (they used to make it and I’ve seen it at some of the larger, more expensive Wal-Marts & premium grocery stores here in the metroplex), so I added about a teaspoon each of oregano and basil. Probably more than you need to add, but we like flavor! 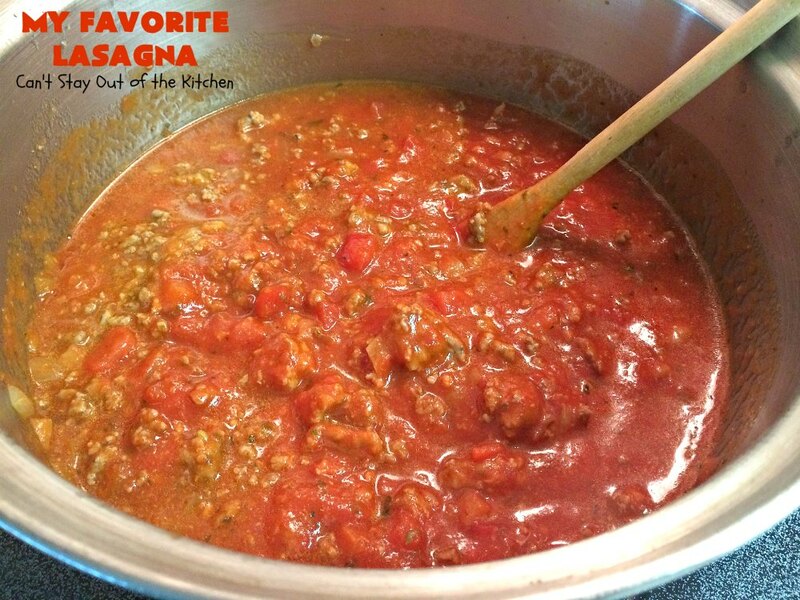 Allow the sauce to simmer on the stove about 10-15 minutes. I recycle old spaghetti jars and use them when draining grease from meats. Grease is horrible to put down your disposal or sinks as it clogs the water lines for city sewage systems and wreaks havoc with a septic system. Spray a 10×15″ baking dish with with cooking spray. 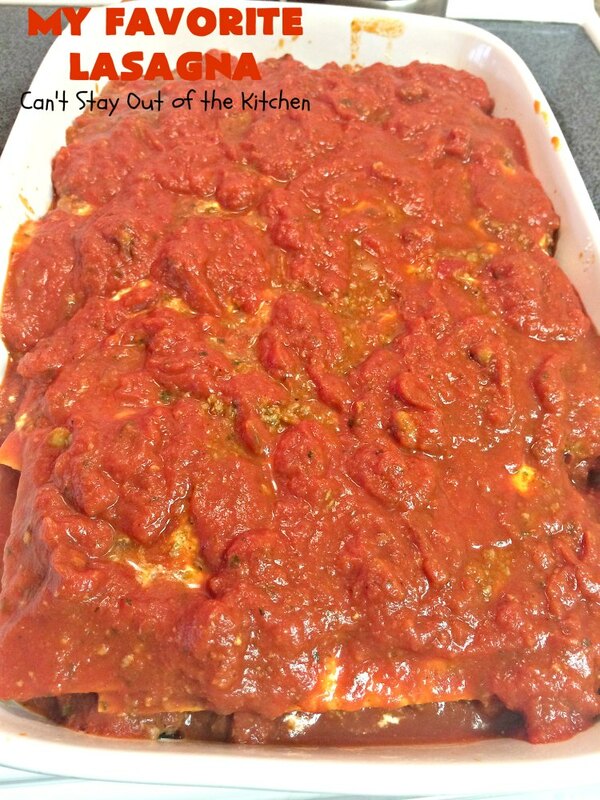 Place a small layer of spaghetti sauce in the bottom of the baking dish. This will help prevent the noodles from sticking to the dish or scorching. Top with a layer of dry, uncooked noodles. Dab with more spaghetti sauce. 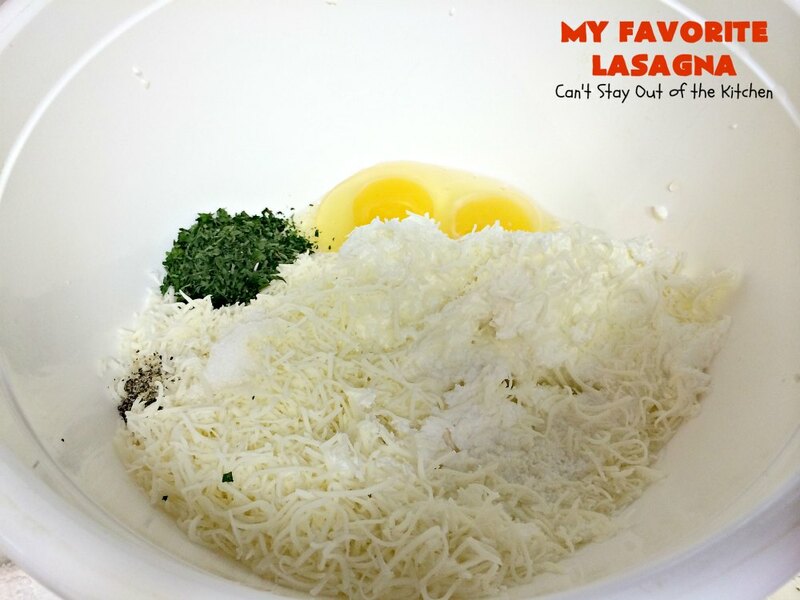 Repeat layers until you have six noodle layers. 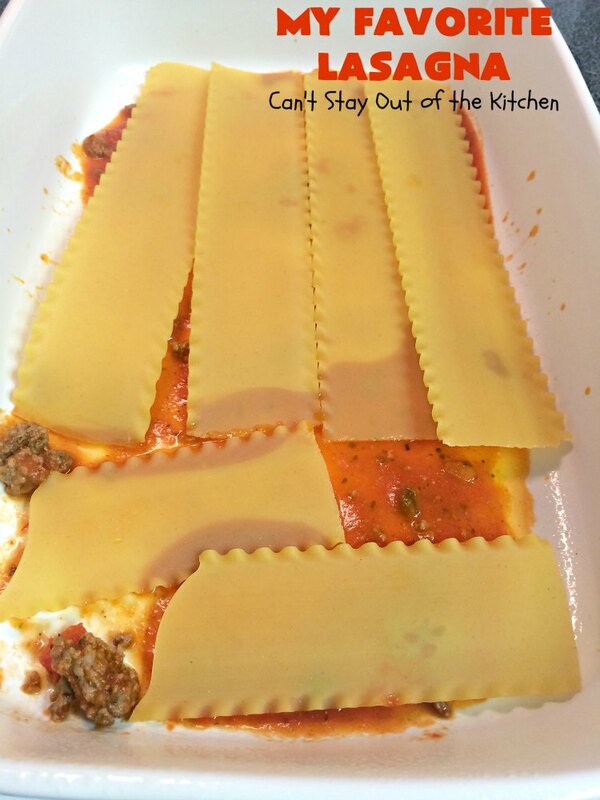 With my change to this recipe you will run out of sauce after the fifth layer. So you have two options. Add an extra jar of spaghetti sauce to the sauce ingredients while simmering, or pour the extra jar on top after the layers are finished. That is what I do as you can see in the picture above. Rinse out any remaining tomato sauce in the jar and add it to the sides trying to cover the noodles completely so they will cook through better. The noodles will dry out otherwise. Sprinkle parmesan cheese on top if desired. Cover tightly with foil and bake 1 hour at 350. Remove the foil, add the mozzarella cheese. Bake an additional 10 more minutes, until cheese melts. 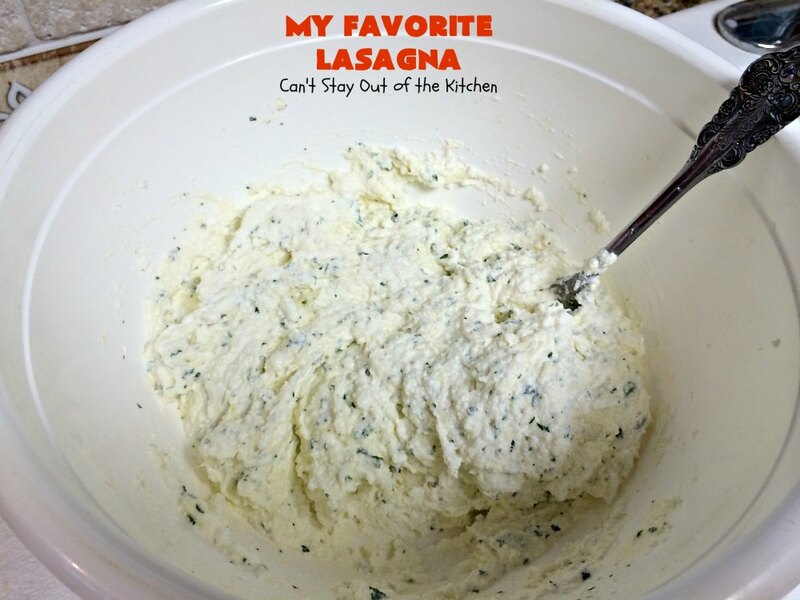 My Favorite Lasagna is so succulent and delicious. Serve with Easy French Bread and a side Greek Salad and you’re good to go! 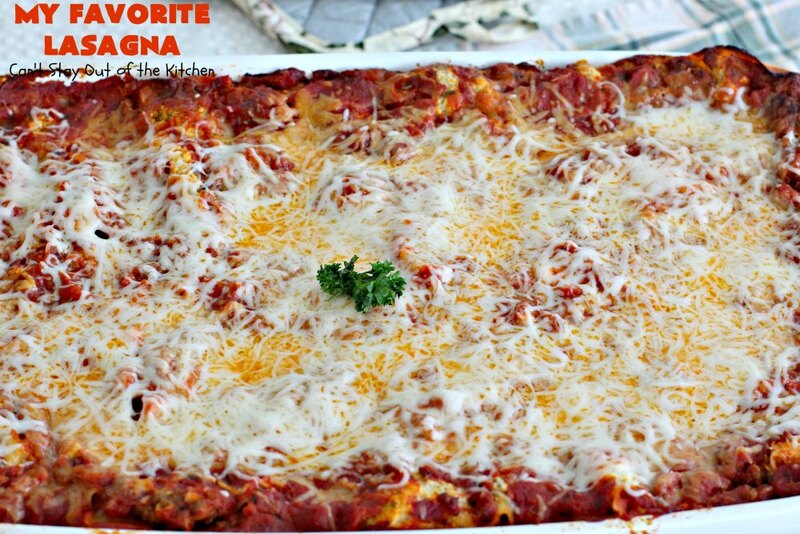 My Favorite Lasagna is a spectacular Italian treat you’re whole family will love. I serve this lasagna for company and birthdays quite frequently. This amazing Italian pasta dish has Italian sausage and ro-tel diced tomatoes with chilies giving it a lot of zest. 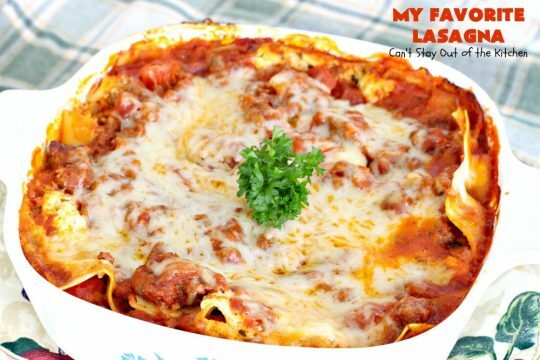 It's one of the best lasagna recipes we've ever eaten, and a family favorite. Perfect for holidays and company. Sauté onion and garlic in a tablespoon of olive oil in a large Dutch oven, add turkey (ground beef) and sausage; drain. Add 2 jars spaghetti sauce, water, tomato paste, basil, oregano and Ro-Tel diced Italian tomatoes with juice. Simmer over low heat about 30 minutes. Mix ricotta, one-half mozzarella, 1 cup parmesan cheese, eggs, parsley, salt and pepper in bowl. Layer 1 cup sauce in 9x13”sprayed pan. Arrange 3-4 dry noodles over sauce, spread dabs of cheese mixture over noodles, then 1 cup sauce and repeat layers ending with sauce on top. If the sauce doesn’t cover the top well, add the remaining jar of sauce. Bake 1 hour to 1 hour 15 minutes at 350°. (Test noodles with a fork. If they are fork tender, they are cooked through). Sprinkle with remaining mozzarella cheese. 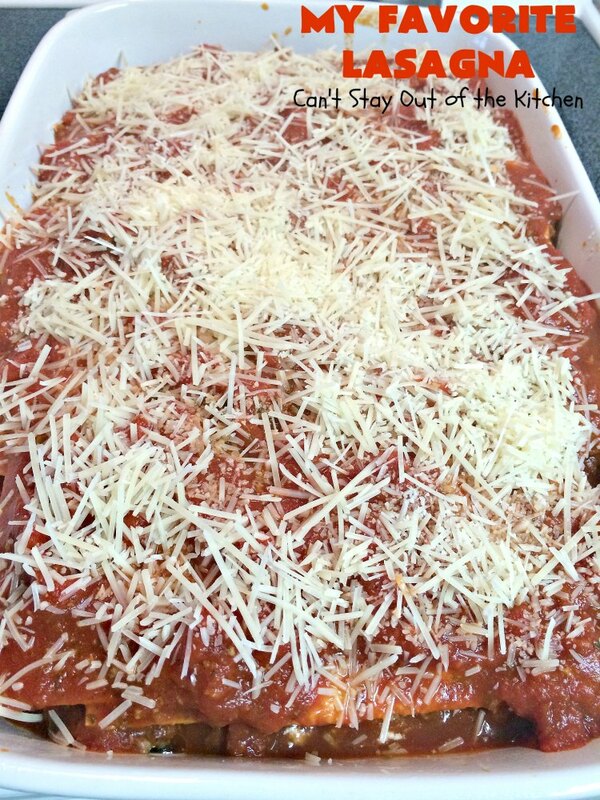 NOTE: I usually spread the ingredients out so that I make 6 layers of noodles, 6 layers of cheese mixture, 6 layers of sauce, topped with parmesan cheese before baking and extra mozzarella cheese after baking an hour. NOTE: If you cannot find Italian diced tomatoes with green chilies, then just use regular diced tomatoes with green chilies. If desired, add about 1/3 teaspoon each of basil and oregano. This amazing Italian pasta dish has Italian sausage and ro-tel diced tomatoes with chilies giving it a lot of zest. It’s one of the best lasagna recipes we’ve ever eaten. Layer 1 cup sauce in 9×13”sprayed pan. I usually spread the ingredients out so that I make 6 layers of noodles, 6 layers of cheese mixture, 6 layers of sauce, topped with parmesan cheese before baking and extra mozzarella cheese after baking an hour. [br][br]If you cannot find [u]Italian[/u] diced tomatoes with green chilies, then just use regular. Yummy! 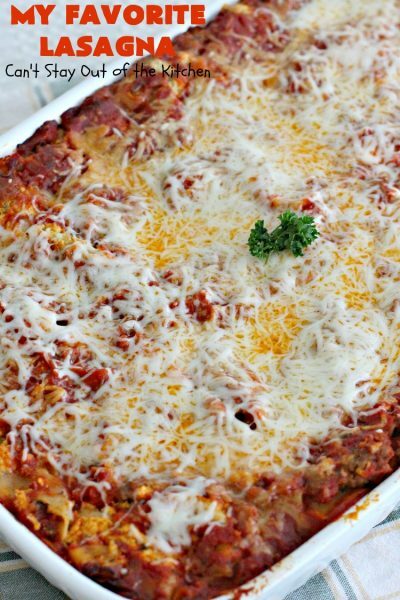 Having the extra kick of the Italian sausage and Ro-Tel tomatoes with diced chilies make this lasagna something special. I think you will prefer it, too. 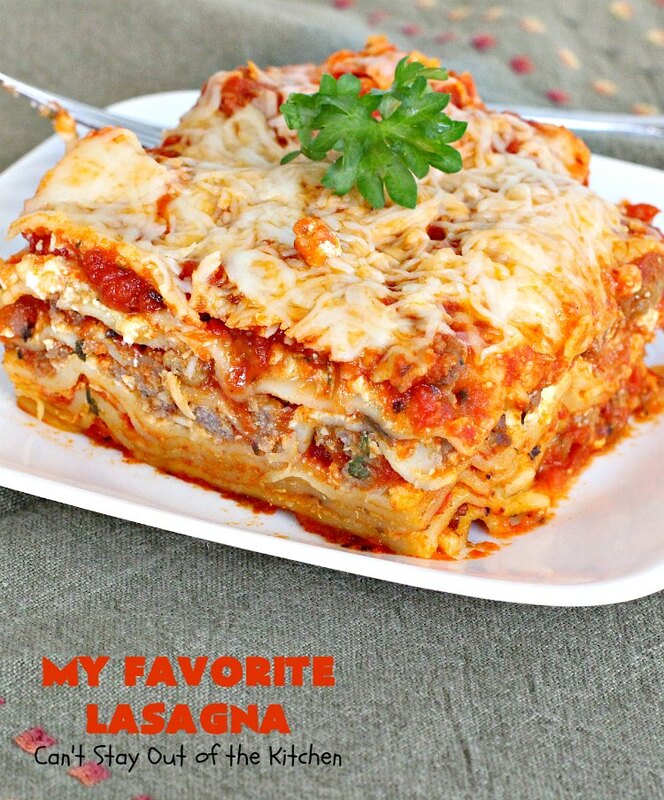 My Favorite Lasagna, while a bit of work, has a tremendously great pay-off! Hi there, I made your lasagna last night. 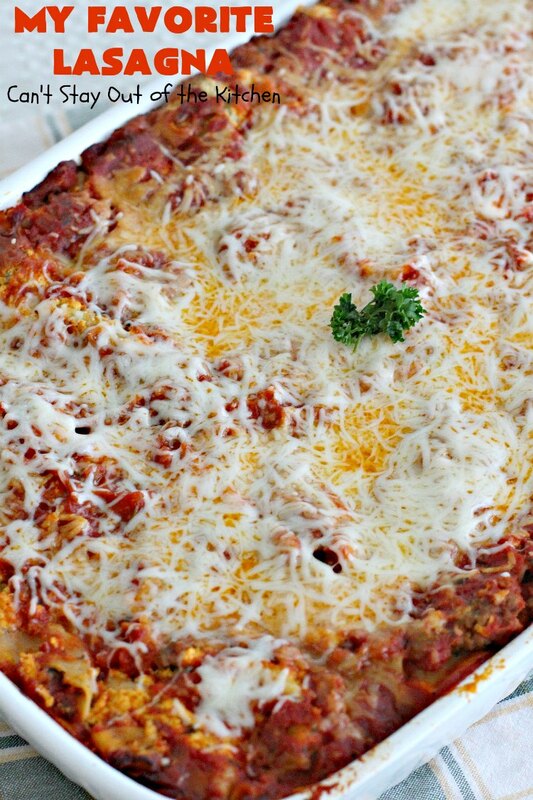 I have never been any good at making lasagna, mine always seems to turn out like spaghetti sauce. This recipe was awesome. I made it when I got home from work and granted it was a little late when we ate but it was so delicious. My husband loved it. I brought it to work for lunch and again I can’t believe I made it. 🙂 Thank you for this wonderful recipe, it will be one that I use over and over again. Hi, Maria. Thank you for such a kind note. I’m really glad the recipe turned out so well for you. We love this recipe and quite frankly, I ad-lib a lot based on ingredients I have on hand and how many I have to feed. I particularly like the hotness from the green chilies and tomatoes and the Italian sausage that makes this recipe a cut above most recipes. I know it’s a bit of work, but I’m so glad you enjoyed it. You might also consider making it to the point of baking it and then freezing until you want it. Pull it out of the freezer a couple of days and thaw in the refrigerator. Then bake when you want to. Or, you can put it straight into the oven frozen. It will take between 2-3 hours to bake that way. Thanks again for stopping by and letting me know how much you enjoyed the recipe. Can’t wait to make it tomorrow! My kids love lasagna! Hi, Mihaela. You’ll love it! It’s certainly our favorite. It has just a little kick to it that makes it terrific. Can this be assembled, then baked the following day? Or should I assemble and bake, then reheat the next day? Help, please!!! Thank you!!! Hi, Susan. I’ve actually done it both ways, but I prefer to assemble it without baking and refrigerate it until the next day. You may need to add some additional baking time if you are starting it from refrigerator cold versus warm from preparation. It does reheat well, too. Hope you enjoy and have a Merry Christmas. Hey, Susan. You can also make this several days in advance and freeze it. Just understand that from freezer to fully cooked may be 2-3 hours. Or you could make it and freeze it and allow it to thaw 1-2 days in your refrigerator and then bake. Again you will need to adjust your baking time. Just saying, in case you had a bunch of other things you needed to prepare on the 24th at the same time. Thanks again!! Can’t wait to try this recipe!! 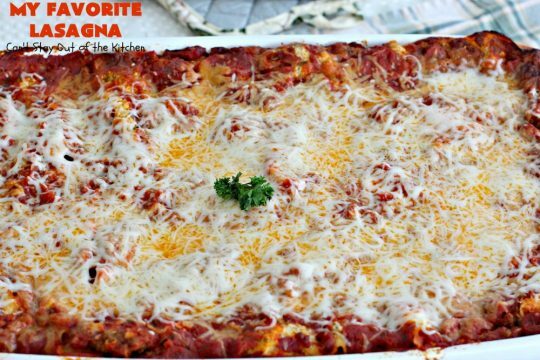 This lasagna recipe looks amazing!!! I can’t wait to try it! Quick question though… Can I use cooked noodles? This is probably a silly question, I’m just not a fan of cooking the lasagna with uncooked noodles, the results are never pretty. Thanks again! Sure Roxy, but you will probably need to cut down the cooking time. You may also have to eliminate some of the sauce because it may become too soupy. The uncooked noodles absorb a lot of the moisture from the sauce as the casserole cooks. Hope you enjoy it. love the ideas you have…seem so easy! I would love to be on your email list! Hey, Linda, there’s an envelope on the top right sideboard of my blog where you can sign up for email. Glad you enjoy the recipes. 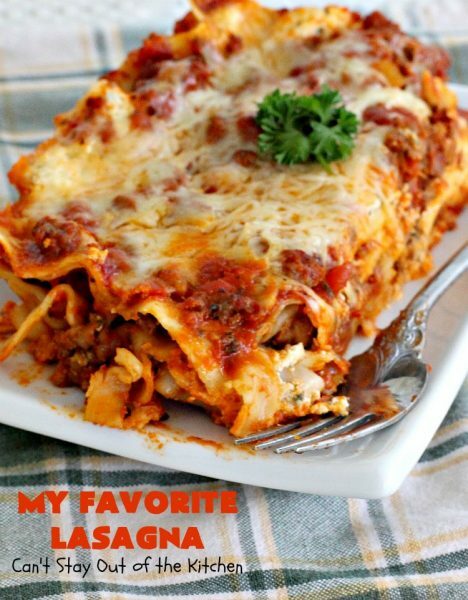 Cheers to lasagna lovers ! Thanks, Theony. It’s a delicious lasagna. I’ve had your wonderful lasagna before. I am serving it to guests tomorrow! I hope you and your guests enjoy! We certainly love this recipe. That looks amazing! 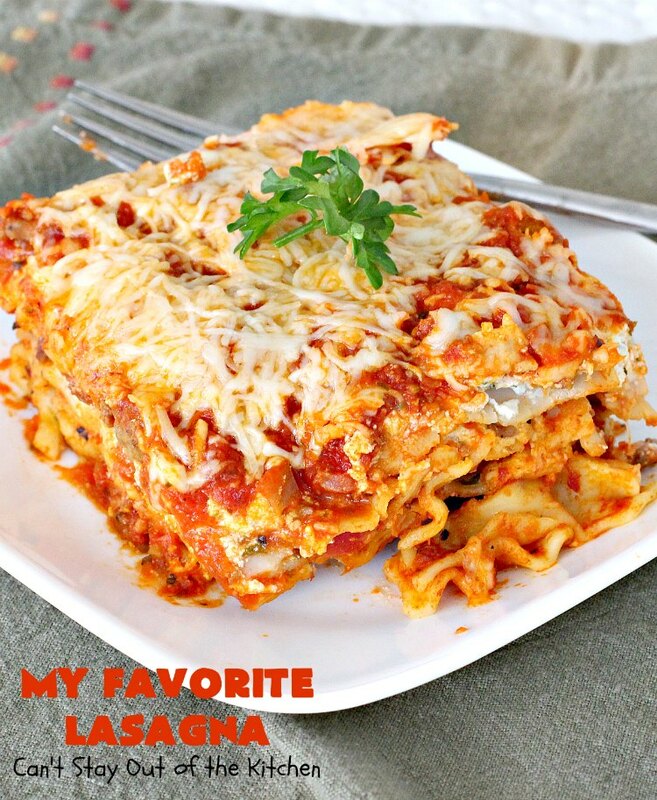 I could totally do with some lasagna right now. 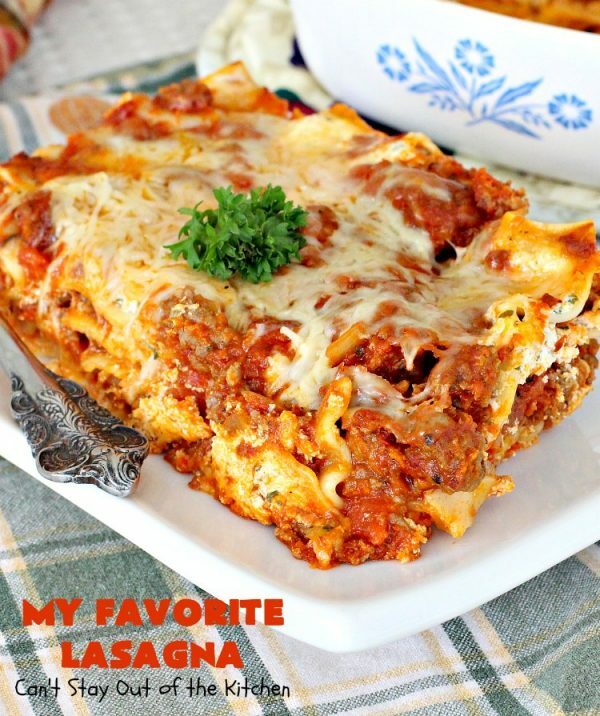 It really is the most delicious lasagna – it has some bite to it with the diced chilies and the Italian sausauge – makes it so wonderful. Hope you try it sometime.